vegaskelly, thanks for posting these recipes! My husband has been going crazy that we don't "cook" anymore and these recipes should be right up his alley! Keep posting! It's better to hear from someone who's actually tried them than a cookbook! Got this from the forums here. Haven't tried this yet but I'm putting Tofu on the shopping list for this weekend. I'll let ya know! I think your receipes are great!!!! I cant wait to try some!! You look great!! Kelly just wanted to say congratulations on your weight loss, you are doing sooooo good. I'm just starting over and seeing the changes in people really helps me stick with it. 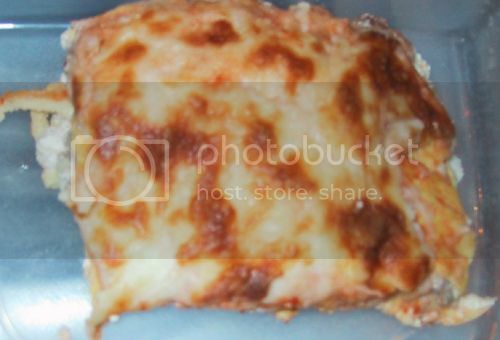 Made the low-carb lasagna this weekend...YUMMO!! It was great and I have leftovers for the week and I will most likely vaccum pack & freeze a few pieces. I used to cook this a lot when I first started low carbing. It is perfect when you are having a craving for Chinese food but don't want to cheat! I will be saving this one. Thanks! I have to ask about this "rice". I am not a fan of cauliflower and am hesitant to try this. But if there is anyone else out there that doesn't like cauliflower, but likes it like this, please let me know. Did you really put 2 cups of Splenda in the french toast recipe? That seems like waaaayyyy too much. Hi Willow, I am sorry I didn't reply sooner. I was in Sacred Bee in February. It's a great store! I got incense. If you go back to the post where Vegas Kelly has posted the picture of her low carb lasagna, you'll see the words, "low carb lasagna" underlined. Just click on that, and you'll come to the nutrition page. There is a link to "view recipe" there. No pic yet, about to cook this up! I think this is one of the best recipes yet. I served it to a non lowcarber and he said it was the best lasagna he had ever tasted. When I click on the link, I just get the nutrition value...where is the recipe? Looks Yum!!!! ooops!!! I found it!!!! lolol!!! Yum!!! All times are GMT -6. The time now is 20:16.